Jenna dan Aron, a Shielder, lives a solitary existence, shunned by her people because she has visions and can see the future. She’s even foreseen her own destiny: to be a human offering, a mate for a savage Leor warlord. When two Shielder colonies need to be rescued, the Leors who are their only hope demand a bride for their leader in return. Knowing she can’t deny fate, Jenna steps forward. The Leors are a hybrid race and only part human. Arion of Saura finds mating outside his race abhorrent, but he has no choice, as his kind faces extinction. His life is ruled by hard logic and physical prowess, with no room for softness or emotion. Bound to him, Jenna faces a life of barbarism with a mate who seems more beast than man. 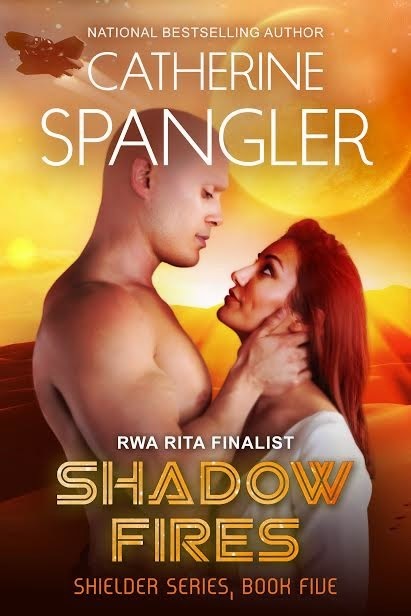 In the relentless heat of the wild Sauran desert, Jenna and Arion wage a battle of wills, until they discover that the heart is mightier than any weapon—and that love can forge shadow and fire together. He stood in the command center, his powerful legs braced as the ship began its descent toward Candest. He maintained his balance with one large hand gripping the edge of the main console. Like his legs, his chest was bare, with well-delineated muscles beneath golden skin. Silent and majestic, he waited. Suddenly his head turned, and his unblinking midnight gaze fixed unerringly upon her. Terror jolted through Jenna, momentarily disrupting the vision. He couldn’t possibly see her. She was inside her modest quarters in Shamara; he was on a Leor warship, still on the outer edges of Candest’s stratosphere. She gasped for breath, her chest heaving, as she tried to dispel the vision, to break its insidious hold on her. But like a nightmare that would not end, the images resumed, sucking her into a clairvoyant vortex she could not evade. . . . He was still standing there. His face was clearly recognizable, even though it had been more than four seasons since she’d seen it—just that one time; even though she’d never actually met any Leors. But she knew him. He had high, bold cheekbones; a powerful, square jaw; a prominent, wide forehead; all creating the frame for surprisingly sensual lips, a starkly chiseled nose, and black-hole eyes so dark, no pupils were visible. No facial hair or eyebrows softened his harsh features; no hair of any sort covered his gleaming head. She’d always sensed the thoughts of those in her visions, and his were no exception. Determination, edged by desperate need and utter ruthlessness. Cold, logical analysis of obstacles to be overcome and the most direct methods of doing so, without compunction or mercy. Again he looked directly at Jenna, and her heart battered against her chest. A staggering energy snaked between them, a treacherous snare. The command center faded from sight, and everything around them ceased to exist. No ship, no Shamara—only the two of them, in the vastness of the universe. The vision ended abruptly, and Jenna lurched out of her chair. She felt the inundating chill and the sick sensation in the pit of her stomach that always followed a vision. Even with the link severed, and even though the Leor’s ship must still be several hundred kilometers away, his powerful presence lingered in her chamber, a brutal reminder of her future. She wanted to run, fast and far. But she knew it was useless. She couldn’t escape him, no matter how hard she might try. She also knew, with absolute certainty, why he was here. Just as she knew what would happen next. Her fate was sealed. She had foreseen it in a vision on Liron over four seasons past, and had long ago learned the futility of trying to alter the course of destiny. Her visions were never wrong and could not be changed. She’d never had any other discernment of her own future, either before or since that fateful cycle of the pink moon; the same cycle that Ranul san Mars, the great Shielder leader, had passed on. Not that it made any difference. Her fate had been decreed by Spirit. She sank back into the chair, willing her heart to stop racing and air to return to her lungs. She couldn’t let panic take hold. It would accomplish nothing. The roar of an overhead ship drew her attention. She rose and went outside, looking skyward. A huge, glittering black and red warship passed overhead, dropping lower as it approached the landing pads. The Leor had arrived. And with him came the end of her existence. Dread clawed at her, and Jenna pressed a trembling hand against the panel frame to steady herself. She wanted to scream out in protest, to rage against the forces orchestrating this cruel turn of events. But it did no good to curse the reality, or to resist it. Her life, as insignificant and drab as it was, had never been hers to command. She’d always been at the mercy of her visions, guided by the will of Spirit, or so she’d always fervently insisted. She couldn’t—wouldn’t—accept the possibility that her ability might come from dark spiritual influences. Just as she couldn’t avoid fate. Slowly, Jenna turned and went inside. She knew what she must do now. Since there was no way she could alter the destiny hurtling head-on toward her, she would face her fate with dignity and make the best she could out of her situation. She slipped on a cape to protect against the chill of the morning, raising the hood to avoid being recognized and shunned. Because of her clairvoyance and her uncanny ability to predict the future, the other Shielder colonists had always maintained a wary distance. Superstitious, forced to expend every micron of energy to survive, they found it simpler to avoid her than deal with their fears. There was nothing for her in Shamara. Nor did anyone care that her destiny was that of mating with the leader of a barbaric and cruel race. Her life here, and her freedom, had just come to an end. Catherine Spangler is a bestselling and award-winning author of the Shielder series (futuristic romance) and the Sentinel series (urban fantasy). She is a two-time Golden Heart finalist and a RITA finalist, and has received numerous other awards and honorable mentions. She is an active member of Romance Writers of America and her local chapter, Dallas Area Romance Authors. A frequent speaker at writers’ groups and conferences, Catherine has taught workshops on the creative process, writing techniques, writing paranormal romance, and goal setting. She lives in north Texas with her husband and a menagerie of critters. She loves reading, taking naps on the sofa with a good football game for background noise, eating chocolate, and playing poker!